Sometimes we are contacted by people with a creative and unique idea that really surprises us! The Hitch Hotel is one such idea! The idea is pretty simple: An expandable trailer, that you can attach on the back of your truck or car. When you arrive at your destination, you can detach it, pull it out, and voila! You now have a place to sleep! It’s still being built at the time of writing this blog post (Kickstarter ends by the end of July 2018 and the project is already funded. The trailer has a window and “door” at the back, so it’s easy to get in and out, once you have parked it and you’re ready to sleep or hang out. You can also use it as for storage during transportation. You can fit two bikes inside it. In the example below the guy uses it to transport his fishing gear and cold drinks. Notice how the legs can fold down to support it when you park. The whole thing is positioned pretty high, so you can go off-road with it. 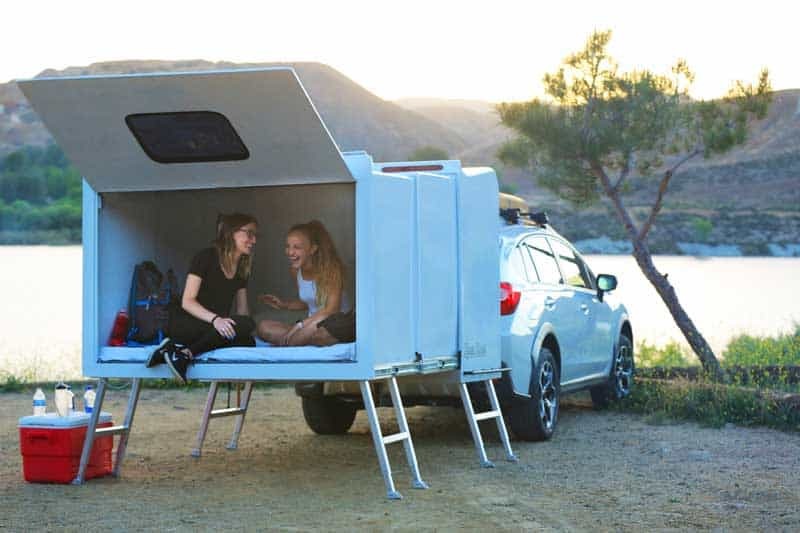 When you look at it from the side, while being on the road, you get why it was inspired by the teardrop trailers in the first place. It’s even smaller, and the fact that you can fold it in and out is just brilliant. The trailer is waterproof, which might sound obvious, but considering the fold-out mechanism, it was probably not an easy nut to crack for the designer. The 7 feet by 58 inches (213 x 147 cm) makes it almost the same size as a queen size bed. It means that you can sleep two people comfortably inside it if you want to go camping. If you want to take a hike during the day, you can lock the trailer. This is also a nice feature during the night, so you won’t have to worry about intruders. Who doesn’t want this view in the morning?